The primary selling points of the Forgotten Realms, to me, are the manipulative, interventionist gods. I’m not a big fan of canned settings, particularly those that accrete a large amount of setting canon, but I think that this basic play on Greek-style gods could work well in a tabletop RPG. I had this book back in my Second Edition days, and though I don’t have memories of using it much, I do remember enjoying the detailed pictures of the specialty priests. 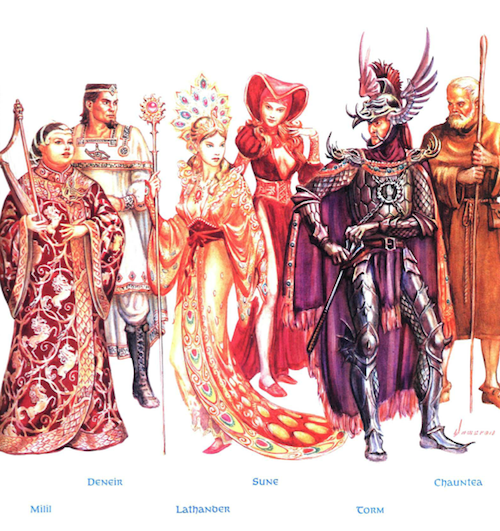 I just picked up the PDF from D&D Classics. This book came out in 1990 and was the primary FR setting product for Second Edition until an updated boxed set was released in 1993. In hindsight, it’s a rather strange book that doesn’t focus much on tools or information that would actually be all that useful for starting up a campaign set in the realms, being instead a mix of splatbook (things like new spells) and gazetteer. Do those sound like the first resources you would want when starting a new campaign? At least for me, they are definitely not, but there are still a few interesting things in this grab bag. The first pleasant surprise was that all the black and white interior art was done by Stephen Fabian, one of my favorite fantasy artists. I had totally forgotten this detail, which, alone, is enough for me to recommend the book; everything else is a bonus. I have included a few samples of some of my favorite pieces throughout this post, though there are many, many more within. This further reminds me that the 2E Tome of Magic also featured Fabian art. Hopefully, that will be one of the next PDFs released. Second Edition also had one of my favorite layout styles: two-tone, clean, unpretentious, and balanced. Third Edition layouts are just gaudy, and Fourth Edition layouts are functional but uninspiring. In terms of actual gameable content, there are several random tables, including a good d100 table of art objects (contained in the treasure chapter), a collection of tables for randomly determining spells, and a somewhat boring table of wild magic effects (not worth your time). The spell tables divide all the spells from each level into common, uncommon, and rare (each with a table) and then provide a meta-table to select which rarity table is consulted. This seems like it would be a decent way to award spells, if you don’t mind dipping into 2E for the spell definitions (virtually all of them should work just fine with any clone). I think that all the spells listed are from either this book or the 2E Player’s Handbook. As I noted above, each specialty priest is essentially a new class, with ability score requirements, weapons useable, armor wearable, cleric spell spheres available, and granted powers. There are a lot of them (over 30). For example, priests of Ilmater (The Crying God, lawful good, portfolio: endurance and suffering) require constitution 14 and wisdom 12, can use bludgeoning weapons and the scourge, may not wear armor, has +4 to saves that involve endurance, can survive without food and water for a number of weeks equal to level, etc. The presentation is somewhat dry, but this content actually plays to the strength of the Realms as a setting (the divine machinations, mentioned above) and is illustrated with a verve not often seen for this kind of my-precious-setting infodump material. It actually makes me want to roll up a specialty priest. The pages on magic in the realms are not very useful (this is an enchanter, necromancers prefer black robes, etc) but many of the spells are useable. In fact, the spells and monsters of Second Edition deserve more attention than they get, being so easy to slot into pretty much any early edition of D&D or simulacrum. 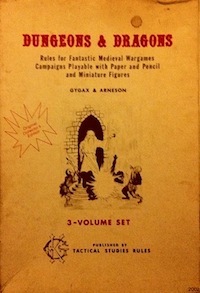 Of special note are a number of necromancy spells, as the school of necromancy is often either underrepresented or significantly underpowered in TSR D&D (the few interesting and effective spells being high level). This is probably because the authors expected necromancers to primarily be NPCs. Given that this is one of my favorite types of character to play, this has always annoyed me. 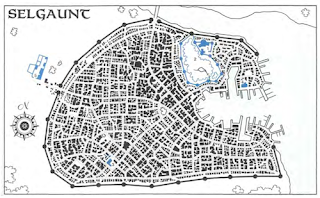 Cities as presented suffer from the 2E template fetish. Every single one has who rules, who really rules, population, major products, armed forces, notable mages, and now I’m bored before I even get to the end of typing all this out. There are some interesting background bits, but I would have preferred if the cities were presented more dynamically, highlighting the aspects that make specific towns distinctive. Each of the 20+ cities also has a rather detailed map that could easily be repurposed. 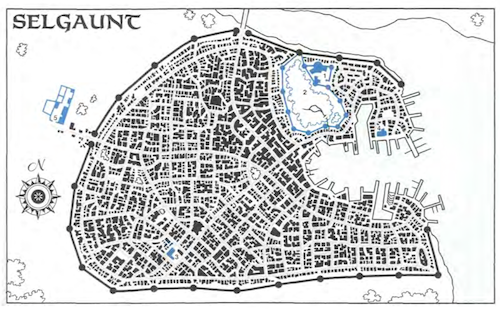 There are some interesting ones, such as Marsember, which seems to be built out over a series of islands (all connected by bridges), Procampur (divided by walls into obvious districts), and Scornubel (a reasonable large unwalled town). Sort of a dry section overall, but not without its uses. Overall, even though the book feels disorganized and sort of arbitrary, it seems like there are things to use, even for a reader who cares nothing for the setting as a whole. Many parts of the treasure chapter seem like they were just paraphrased from a geology book, but the system as a whole looks like a reasonable (and more detailed) replacement for the official random treasure tables. This entry was posted in Uncategorized on February 4, 2013 by Necropraxis. Are you telling me that “Forgotten Realms Adventures” doesn’t actually have any adventures in it…?! Yeah, no adventures. 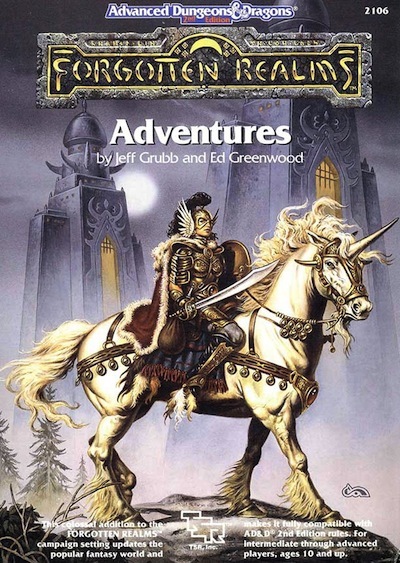 “X Adventures” was the naming convention for setting hardcover books for a while (see also Greyhawk Adventures and Dragonlance Adventures). I had completely forgotten about the Tome of Magic. Sheesh. Yeah, the Tome of Magic is pretty good. The wild magician as a whole kind of left me cold, but the d100 table of wild magic effects is decent, and there are all the new spells. More PDFs are scheduled to be released on dndclassics.com tomorrow, I think; maybe that will be one of them. To me, a lot of the 2nd Edition releases got the atmosphere right, you know? I’ve always considered that a strength of that edition, at least from an art standpoint. Looking at this publication really gets my roleplaying urge going! Yeah, for me it’s a mix, but they definitely got some things right. This is the age of setting proliferation, Brom, Tony DiTerlizzi, and Keith Parkinson. And of course Stephen Fabian. I JUST picked this book up at an auction recently. So I am planning a big Realms deep dive one day. Kinda of a big deal for me really. I never liked the Realms and was always a Greyhawk fan. As I started in 2E, Forgotten Realms (and Dragonlance) were more central to my D&D experience than Greyhawk (mostly because of the novels, I think). 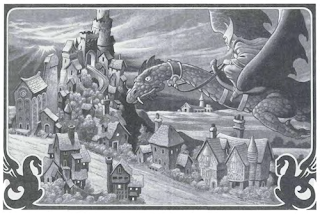 Greyhawk always seemed sort of mysterious to me, being the setting more associated with 1E (which had assassins, demon princes, and succubus breasts). I still don’t feel like I know much about the Greyhawk setting, despite being more familiar with a number of classic modules now. One of these days I will check out a copy of the original Greyhawk Folio edition. You probably need some other setting material to go along with this book to run a Realms game though, given how scattered FR Adventures is. But it was also the first to make me think too many cooks (or just too many ingredients) could really spoil the soup, and that fantasy tropes could be used in a way I’d actually find boring. Manipulative, interventionist gods don’t really do it for me either, tough a friend of mine was a big fan of the Time of Troubles, seemingly for this very reason. I got the most use out of that random art objects table. Whenever I gave one out I’d replace it with something different that I made up myself. The players loved the things – they even named one of their adventuring groups after one of the art objects. Not quite worth buying the book for, but certainly very useful. Yeah, that is an excellent table. My introduction to Faerun, and to date my only real expousre to it, were R.A. Salvatore’s books. While I find it a stuiable enough place to adventure, I it doesnt’ really tickle my fancy. That said, the cleric quintet was awesome. It’s been a long time since I read the cleric quintet, but I remember enjoying it. I know it’s sort of fashionable now to hate on Salvatore and Drizzt (as one of the standard bearers of WotC intellectual property and the source of the two-weapon + pet type of ranger), but I actually like the first few trilogies and a few of the follow-up books (Starless Night, etc), though I haven’t read anything that was published after the late 90s. As simplistic as it is, The Crystal Shard would be an excellent scenario (wizard with corrupting demon artifact, etc). The one downside of the Salvatore drow books though is that they have banalized or defanged the drow to some degree. They are no longer as fearsome and mysterious as nemeses. I concur. I’ve even re-read the Icewind Dale and Drizzt trilogies a few times by now, and enjoy them immensely every time. Are they a little patronizing? Sure. The characters are so proficient at what they do that danger starts to feel false after awhile. And while my interest drops off after the first two trilogies; I have read them up to “A Thousand Orcs,” and they are good, even if they suffer from jarring tonal shifts. Regarding the de-fanging of the drow, I’m not Salvatore can really be blamed for that. Certainly he was the direct cause of it; even though the Drow in his fiction are fierce. But if it hadn’t been Salvatore, it would have been someone else. No single creature or monster can remain terrifying forever. By necessity the longer they exist, the more accustomed we all become to their presence. If Salvatore hadn’t de-mystified the drow, maybe we would have had another few years of them being a mysterious and interesting villain. But Salvatore helped move them into the next stage of their development while they were still in their prime, which I think may have been beneficial overall. I don’t think it’s just an effect of using the drow, but also the specific, heroic character of Drizzt, which has certainly single-handedly fueled the desire of many players to create drow PCs. It’s true that “dark elves” are an attractive archetype, but I’m not sure someone else necessarily would have done what Salvatore did. Compare to Githyanki, another superficially sinister and attractive monster, that was introduced at around the same time, and hasn’t had nearly the same degree of exposure. That’s a fair point, but the Githyanki never had the same level of appeal that the drow did. They’re also decidedly more ‘high fantasy,’ (less human looking, live on a different plane, etc) while drow (based in folklore, very familiar form, live terrestrially) are a more ‘low fantasy’ type of creature. Low fantasy is a lot easier to write fiction about, because the characters are more relatable. I reread the Drizzt books a few years ago. In my opinion, they were mind numbingly bad, much like the Dragonlance Chronicles, which I also reread. Also. rangers fighting with two weapons has an interesting dual heritage, in that Drizzt was not the inspiration for that ability in second edition (rangers cannot wield two scimitars under the rules, in fact). Rather, Cook was probably inspired by the Aquilonian borderers of REH’s Conan tales, who seem to favour hand axe and dagger. 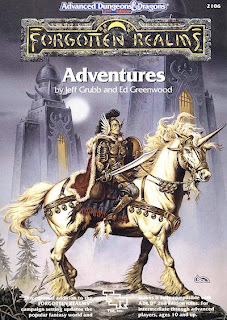 As I see it, Forgotten Realms Adventures is really more of a companion and supplement book to the first edition setting boxed set. So, looking at in isolation may give a false sense of its usefulness (though actually I think you have been more than fair).